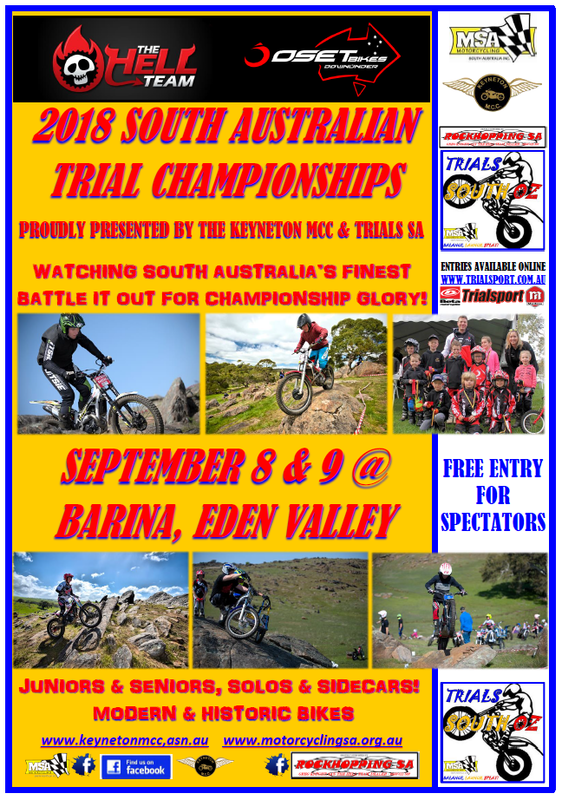 The Keyneton Motorcycle Club, along with Trials South Oz is excited to announce that the 2018 South Australian Trial Championships will be heading to one of SA’s most iconic venues in Barina, at Eden Valley, which hosted the 2011 Australian Championships, a number of SA Women’s Cups & Diener/Holmes Sidecar Trophy events, as well as the 2017 Peter Sparkes Sidecar Trophy during Trials Week SA 2017! The Keyneton MCC is also very excited to announce that Paul Arnott’s The Hell Team and Peter Goddard’s Oset Bikes Downunder are joining forces in a joint major sponsorship of the 2018 Championships, with The Hell Team supporting the ‘senior solo’ classes and Oset Bikes Downunder supporting the ‘junior solo’ classes, which will also include the non-competitive Mini Trial class! The Hell Team and Oset Bikes Downunder are both based in NSW, but are well represented here in South Australia by Greg Knight and Rockhopping SA, and with Greg also a Keyneton member, it is guaranteed that Greg will be on site with a well-stocked trailer for the Championships! And in exciting news for the 2018 Championships, South Australia will crown a new SA#1 in both, Open Solo and Open Women, as the current #1 riders, Haydon Ahrens and Tasmanian Jenna Lupo will both not ride, and with Connor Hogan and Sofie Kraft also absent from this year’s Championships, it really does open the door for the ‘next generation’ to step up and take their chance! Entries for the 2018 The Hell Team & Oset Bikes Downunder South Australian Trial Championships will open on August 1st, and close on Monday, September 3rd, with the sup regs and online entries to be available at www.trialsport.com.au/entries, and as always, we thank Peter Arnold from Trialsport for making this easy to use program available! AND YES - there will be a chance to ride the Championships in a non-competitive way - solo, sidecar & Mini Trial - just like every trial during the year in SA! The likely riding conditions for the 2018 Championships will be; 4 laps of 12 sections each day for ALL classes - with different sections each day as well - and in a 6 hour time limit, starting at 10.00am on Saturday and 9.00am on Sunday. Although a lot of the details are yet to be finalised the event will be fully catered both days and have free entry to the venue for spectators - which will be a fairly easy walk for them as well! Spectators will have the chance to watch many of South Australia’s finest exponents if the trials discipline, from ages 4 to 74, and on modern and classic machines, and on sidecars as well as solos – there will be something for everyone to watch! The Keyneton MCC and Trials South Oz, along with Motorcycling SA look forward to seeing you all there on September 8 & 9!